You can have faith, but still be hopeless. After being a Christian for over 60 years, I, too, lost my hope this past year as I faced overwhelming and multiple physical challenges. When you lose your hope, you not only lose your mooring and your grounding, you also lose your vision and your dreams. But God…loved me so much…that he used my pain and suffering to teach me what real hope in Him means. This is such a timely book! Nancy Missler has once again faithfully shared the truths of God’s Word that she has learned in a time of trouble—incredibly deep trouble. Her willingness to share her story, even when it includes being transparent about weakness and failure, allows us to walk that path with her and see why the truth she found is so profound and important. Her words will inspire and equip readers to find the Hope they need, and be ready to share it with others! Thank you for sharing a little about this book. I woke up angry and tired, from all that is going on in my life. Just what you wrote changed my perspective on my trial, or perhaps changed my perspective on how I should be responding, it already gave me hope, that there is purpose and promise, like Abraham, I should by faith and patience (ie: persevere) inherit the promise. I ordered the book, so I can learn how to wait in hope through this. I’m very depressed right now and I sometimes feel there is nothing left to live for. Your web site makes me feel a lot better. Please pray for me. I love you people very much and I love your web site. You make me feel better. Keep up the good work. I’m a fairly new Christian who has cancer. I just got done with my “fluff” book and started “Hope Against Hope” this afternoon. I’m hooked and I’m only a short way in. I wish I could meet Nancy…If truth be told, I wish she were here with us and could be a speaker at Night of Hope!! She’s already taught me stuff in just the few pages I have read. Thank you so much for sharing her book with me…D.H. Prayers for you Nancy… and a few scriptures, “Peace I leave with you, my peace I give unto you…” Jn 14:27 and “I will pour out my Spirit upon all flesh.” Acts 2:17 Lord we pray for this woman of God in Jesus precious name that you will heal her, fill her, and give her peace that passeth all understanding in Jesus name! Hi Nan: Your book will be an inspiration to our congregation; our church building was sold; a young couple are converting it into a home; but we are still a church body today, without a building; believing God for an open heaven and miracles. We are standing in God’s love and unity. Our Bible Study Group have studied your Way Of Agape and and Be Ye Transformed and they have ministered to us greatly. I have also enjoyed Faith In The Night Seasons; it was great too. 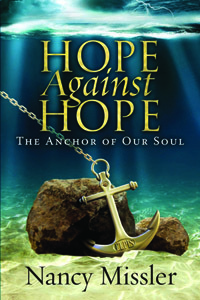 We are looking forward to purchasing Hope Against Hope and your complete healing in the Lord. May God’s blessings and love be with you and your family. 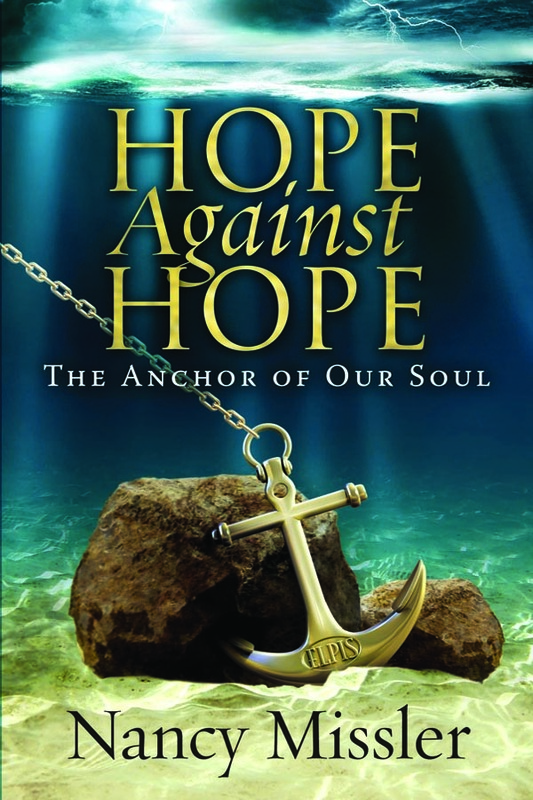 Our ladies Bible Study would like to do Nancy’s new book, Hope Against Hope, in the Fall. Do you think the book will be available by September? We would order one hundred or more copies. Our ladies have been praying for Nancy.